Our purpose is to educate and adjust as many families as possible toward optimal health through natural chiropractic care. There is a condition known as vertebral subluxation that can interfere with the body’s ability to regulate itself. This condition, which is a misalignment of a vertebra in your spine, can be the underlying cause of many of the health problems that people suffer from every day. Subluxations are primarily caused by trauma. You may experience a sports injury, car accident or slip and fall, though there can be much more subtle causes such as posture habits, sleeping habits and chemicals we consume. These many injuries add up to devastating effects, starting from the day you were born. That’s why at Full Potential Chiropractic, we recommend having every member of your family checked, so that subluxations can be detected and addressed as early as possible. When your subluxations are reduced, you can experience the benefits of chiropractic care with a nervous system that functions at a higher level. Your bodily systems may improve, and aches and pains resolve while you can digest food, breathe, balance and sleep better. Athletes often achieve their best performance yet. Though we don’t directly treat those concerns, when there is less interference in your nervous system, your body can control and regulate itself at a higher level to express greater health. As a family wellness practice, we often see children who are referred to us for help with chronic ear infections, irritability and sleeping issues. Your care will be tailored to what you require to resolve your health challenges and reach a higher level of wellness. If you’re in pain, Dr. O’Brien might recommend a few visits a week to get you out of that crisis. Our initial, intensive phase of care begins with three days per week. Progress evaluations are performed every 12 visits to monitor your response to care and make any changes to the frequency of your visits. Dr. O’Brien will recommend incorporating exercises and traction as appropriate. Ultimately, our patients choose to transition to supportive care, during which you’ll see us about once a week. The final phase of care is wellness, which maintains your optimal spinal health and involves visits once a week to once a month, depending on what you need. 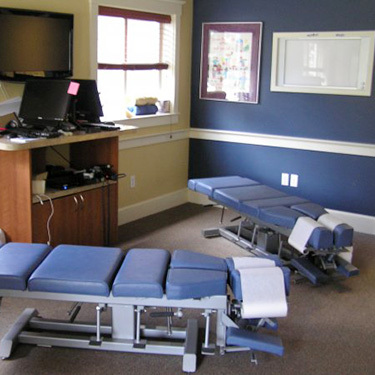 Dr. O’Brien uses specific, comfortable methods for your adjustments. She is certified in Chiropractic BioPhysics®, a postural correction-style of care. Additionally, she incorporates adjustments with a drop table that are low-force and precise and Diversified Technique. Exercises, traction and blocking procedures are used as needed, and you’ll be given homework such as exercises to support the corrections we’re making. If you’d like to find out more, contact us today! We’re pleased to offer complimentary consultations.